OVERALL LENGHT 100" OVERALL WIDTH 51" OVERALL HEIGHT 67.5"
VIBR.FREQUENCY 4000VPM CENTRIFUGAL FORCE 7000# NOMINAL AMPLITUDE.014"
FUEL CAPACITY 18 GAL. CURB CLEARANCE 23 IN. SIDE CLEARANCE 2 IN. 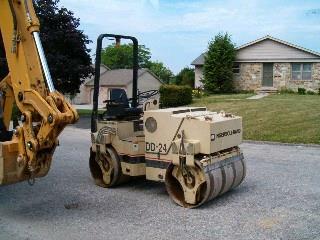 * Please call us with any questions about our vibratory 3 ton asphalt roller rentals serving Bensenville IL, Lombard, Des Plaines, and the Chicagoland Suburban Area.